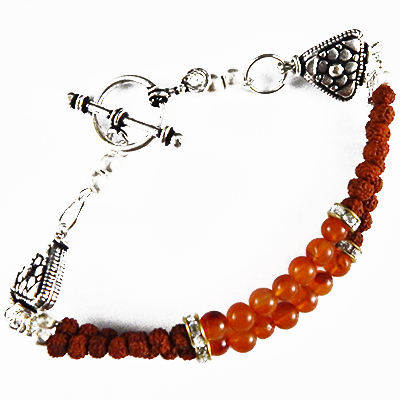 Carnelian Tumble, Beads and Rudraksha Beads with Copper metal beads with Silver Polish. Carnelian increases personal power, creativity, energy gives courage. It helps in meditation by increasing concentration. Helps in blood circulation, aids in male impotency, increases appetite, alleviates problems of the liver, bladder, kidneys and spleen.